Wood, M., Panighello, S., Orsega, E.F., Robertshaw, P., van Elteren, J.T., Crowther, A., Horton, M. & Boivin, N. 2016. Zanzibar and Indian Ocean trade in the first millennium CE: the glass bead evidence. Archaeological and Anthropological Sciences. 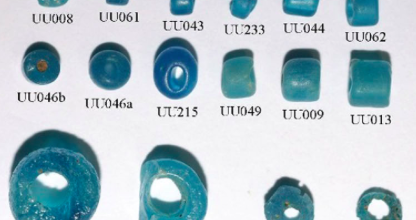 Recent archaeological excavations at the seventh- to tenth-century CE sites of Unguja Ukuu and Fukuchani on Zanzibar Island have produced large numbers of glass beads that shed new light on the island’s early interactions with the wider Indian Ocean world. A selected sample of the beads recovered was analyzed by laser ablation-inductively coupled plasma-mass spectrometry (LA-ICP-MS) to determine the origins of the glass used to make the beads and potential trade relationships are considered. The data show that two major glass types can be identified: mineral-soda glass, m-Na-Al, produced in Sri Lanka (and possibly South India) and plant ash soda glass. The latter comprises three subtypes: two with low alumina concentrations and different quantities of lime (here designated v-Na-Ca subtypes A and B) and one with high alumina (designated v-Na-Al). The v-Na-Ca subtype A beads are chemically similar to Sasanian type 1 glass as well as Zhizo beads found in southern Africa, while v-Na-Ca subtype B compares reasonably well with glasses from Syria and the Levant. While the mineral-soda beads were made in South Asia, it appears likely that at least some of the plant ash beads were made in South or Southeast Asia from imported raw and/or scrap Middle Eastern glass. In contrast, during this period, all beads imported into southern Africa were made of Middle Eastern glass from east of the Euphrates (v-Na-Ca subtype A) and appear to have arrived on ships from Oman and the Persian Gulf. These data suggest that the two sections of the African coast were engaged in different Indian Ocean trade circuits.